This is going to be the most colourful post I have ever posted! Today is Children's Day. It's a school holiday for children who are in the primary and pre-schools here. 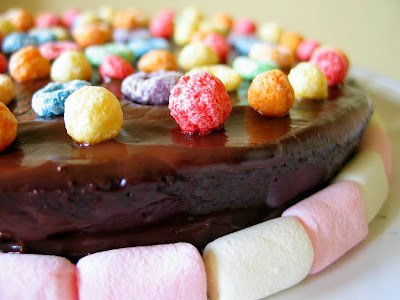 I made this cheerful rainbow chocolate cake for the kids this morning. I used a straight forward chocolate cake recipe, "Devilishly Moist Chocolate Cake" from The Cake Book, by Tish Boyle. Well, I believe, any chocolate lovers will surely be attacted to a cake with such a name. The cake is made with oil, as such, it's suppose to remain soft and moist even when refrigerated or frozen. I decided on this recipe as I have all the ingredients on hand, and it seems to be one of the simpler cake to make. I didn't use an electric mixer as stated in the instructions. I used a manual whisk and spatula instead. The only problem I faced was when mixing the wet ingredients to the flour mixture...it took me some arm power to get the mixture smooth. Fortunately, my little helper was around, waiting eagerly to take over while I rest my arm for a few seconds. The mixing became easier after my boy helped pour in the hot water gradually. The final batter was very thin and watery! I halved the recipe as a 9" cake is too big for us. Somehow, my mind was not working well, and I used a 8" instead of a 7" pan. As a result, the cake was rather flat and short in height. To make up for the height, I sliced the cake into two thin layers and filled it with chocolate frosting (melt over low heat, half cup of cream with 150g dark chocolates) and banana slices. I covered the entire cake with a thin layer of the remaining chocolate frosting. 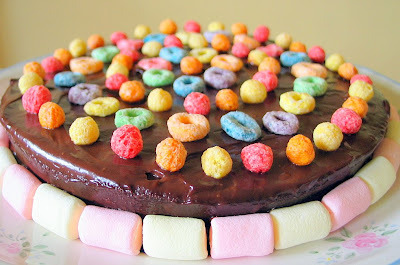 I decorated the top with colourful kids cereals...Trix and Frost Loops, and added a ring of marshmallows on the side. If not for my kids stronger preference for a chocolate frosting, these colourful bits will look better if I were to use whipping cream. 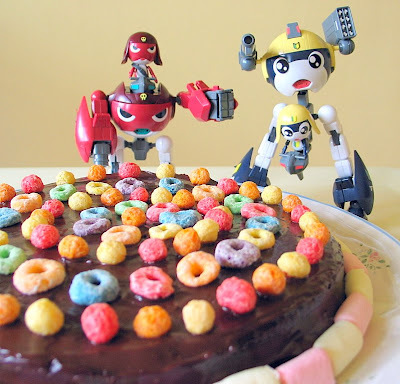 While I was busy with the cake, my elder boy spent the entire morning fixing the two toy robots (Keroro Gunso) I got for them. He managed to assemble all the various small parts without my help. I thought these two figurines really look cool! Here's the recipe for the Devilishly Moist Chocolate Cake. Sift together flour, cocoa powder, baking powder, baking soda and salt into the bowl of an electric mixer. Add in sugar and mix at low speed until blended. (I used a spatula to mix in the sugar). Add in the oil and mix a few seconds until the dry ingredients are crumbly. (I used a spatula to mix in the oil). In a small bowl, whisk together the eggs until blended. Whisk in the milk and vanilla extract until blended. With mixer at low speed, add the egg mixture to the flour mixture and mix until blended, scraping down the sides of the bowl necessary. (I used a manual whisk to do the mixing. The batter will be very thick at this stage). Pour batter into the prepared pan and bake for 45 to 55 mins until a toothpick inserted into the centre comes out clean. Cool the cake in the pan for 20mins before unmoulding. Let cool completely. - Place pouring cream (I used one tin of Nestle's pouring cream) and 150g dark chocolate in a saucepan over low heat. Stir until melted and smooth. Set aside for 10mins before frosting the cake. - Slice two large bananas, lengthwise into halves. Squeeze some lemon juice over. - Slice chocolate cake into 2 layers. Spread one layer with the chocolate frosting, arrange the sliced bananas (cut side down) on the cake layer to form 2 concentric rings. Cut the bananas as necessary in order to form the two rings. 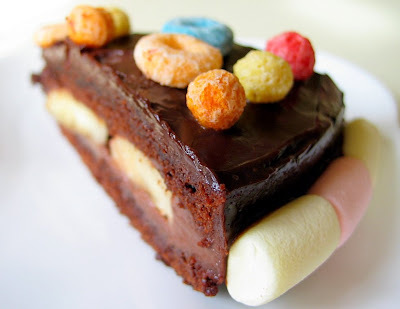 - Spread the other cake layer with chocolate frosting, flip over and layer it over the banana slices. - Coat the top and sides of the cake surface with the remaining chocolate frosting. 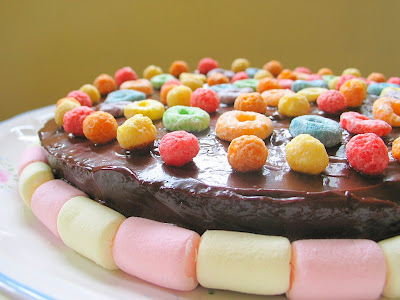 Decorate with colourful cereals and marshmallows as desired. Wow, what a beautiful and tasty looking cake! It looks so festive and colourful!! A great cake for a special occasion! I love the combination of bananas and chocolate! Do you have the recipe somewhere in your index? 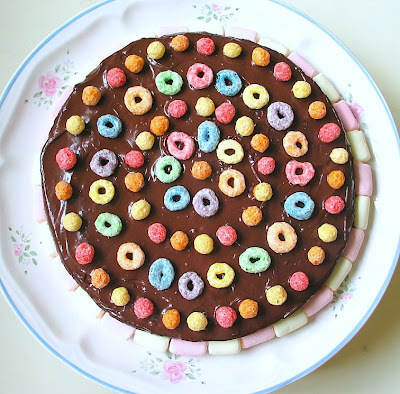 I feel like making this cake too, since I have some bananas lying around. Thanks! dear all, thanks for your lovely comments! Kat, I have just posted up the recipe. Do note that I used only halve the recipe. You will need to increase the amount of chocolate frosting if you are making a 9in cake. My boys have told me that they want to collect the other characters from the Keroro gunso!! Hi happy homebaker! I made this cake today. I used 110g of brown sugar instead. It taste quite nice and not too sweet. I think this recipe is more healthy version compared to the torte? But taste wise, I think torte is better. I always try out your recipe. Never disappoint. Thanks! Looked forward to more healthy cake recipe! It has Froot Loops! I want it! Bananas too, very much an under-used fruit. How fun and colorful! Your kids must be so proud to have the best mom around! Hi Neglick, I have no career experience or formal training in baking...have not attended any baking workshop or classes. 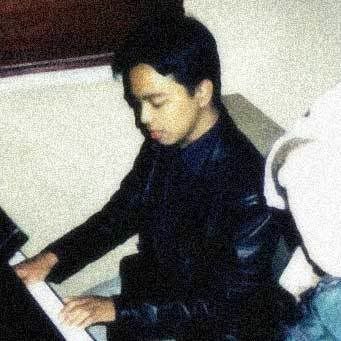 Believe it or not, I was an Engineer by training!! I borrow many baking books from our libraries here. I read them to get an idea, and I started off with very simple bakes such as cookies, muffins and quickbreads, before slowly moving on to more challenging ones. It helps that I managed to borrow several books (mainly Japanese to Chinese translated ones) which provide many step-by-step photos. It certainly helps for beginners. To get it right, always make sure you have the ingredients measured correctly, make sure your follow the recipe closely especially the steps, in sequence, use the right equipments, correct pan size and make sure the oven is preheated at the right temperature. Hope this helps, and happy baking!! you are sooOOo good in Baking!! I m refering to your " Peach Layered Sponge Cake" , Can u pls tell me what is the oven temperature when u're baking the cake? Would like to know how many gm is one tin of Nestle pouring cream that you are using. I wonder if I can find it over here. Can I just use Nestle cream or Nestle all purpose cream? Was thinking of making this. Thanks! Hi happy homebaker. One more question. Why the top of my cake always crack? I tried shifting it one rack lower from the middle shelf. Problem still persists. And sometimes one side of the cake top is raised higher than the other side. Don't know what's my problem. hi Denise, I am not as good as you think...there are many many good bakers out there...I am just starting =) I baked the sponge cake at 180 degC. dear Delia, you can always use dairy whipping cream for the chocolate frosting. I used the Nestle cream as I have it in my cupboard for a looong time. It's 170g in wt (as stated on the tin.) Do note that the portion I used is meant for a 20cm cake...if you are making the 9 inch cake, you will have to use extra frosting. I've tried making this cake before, but it turned out dense and heavy. I think it's due to the cocoa powder i used. Where did you get the natural cocoa powder ah? You know if PH cocoa powder is natural or alkalized? Hi... Using whatever leftover to create something so nice is what i call creative. I will follow recipe closely and even if i hv anythg left over, i just keep it till another recipe calls for it haha. 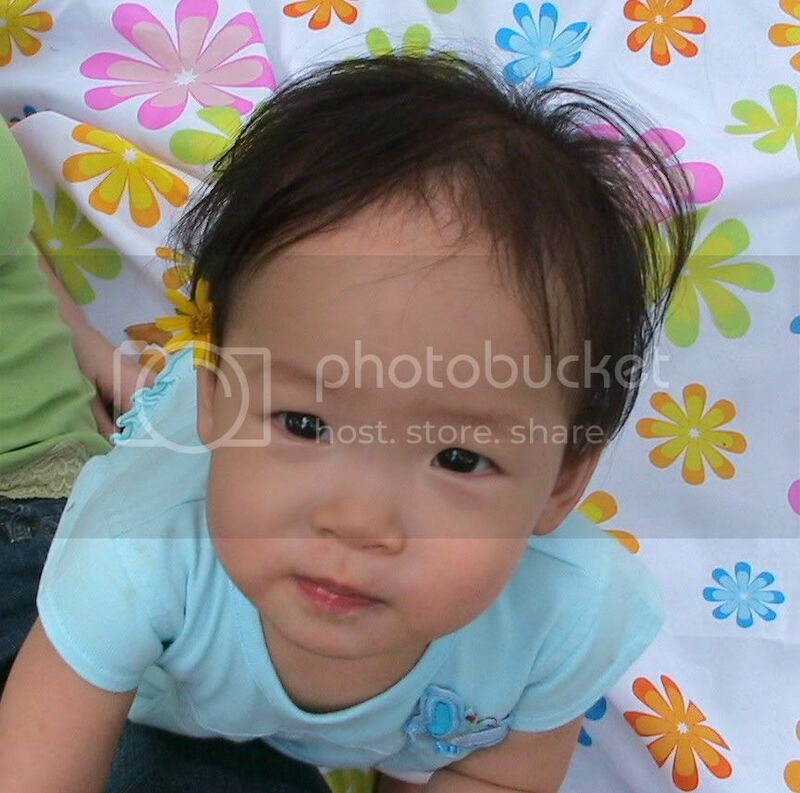 will c what is the outcome, thinking of doing it tmr, else dh overseas till sat, also no one at home to eat .. hehe excited. Hi Sherlyn, me too, when I first started off, I didn't know there are such differences...and I was really confused with the different types of creams (single cream, heavy cream, dairy, non-dairy)!! Hi Happy homebaker! one last question. Which of brand of electric mixer do you recommend? My present one took 45 mins to beat the batter till ribbon like for sponge cake. Is there one that super duper powered that can whip up the batter in 7 to 8mins? Wow, 45mins is super long! Is yours a handheld or standing one? Did you leave the eggs at room temperature before starting (take out from fridge at least 30mins or longer before u start). I use a handheld mixer (no brand! )...it's at least 20yrs old, but still working fine. can beat the eggs within less than 10mins. I can't give any recommendation, as I'm as clueless as you! so sorry, not much help right?! I made this cake last nite. It turns out very dense but moist. I'm not sure where it goes wrong? How's your cake texture like? Hi Delia, the texture of this cake is supposed to be dense and moist...almost like a brownie. Hi happy homebaker, then the cake texture that I made last nite is correct cos it's dense and moist. I tot I got it wrong. Thanks for the recipe. I wanna check. Wat's granulated sugar? I dun seem to be able to find it. Wow...i love this cake so much, thanks for your guide to help me how to make one. Hope you will have more beautiful cakes like this. You are quite creative. I appreciate the recipe. 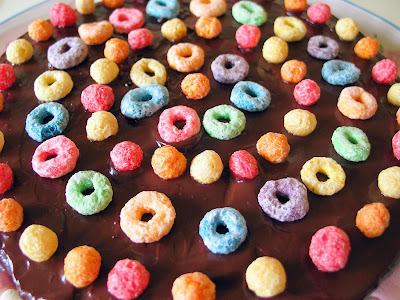 I have a great recipe for Coca Cola Cake at http://hubpages.com/hub/Coca-Cola-Cake-Its-Awesome/ if anyone would like it. It’s really great. I had the Sheriff and the President of one of our local banks fighting over the crumbs. Have a great day! hi, for the whole milk.. can i use pure milk instead? Hi, yes you can use pure milk, I don't think there is any problem with it, happy baking! oh no, i use excatly about 300 plus grams of sugar.. i just read above.. did u only use 120g of sugar? Hi, I use half the recipe as I do not have a 9" pan and further reduced the sugar to 120g. The original recipe calls for over 300g of sugar. Chocolate likes acidic flavors. It marries well with sour cream, yogurt and buttermilk. Great stuff,Baking cakes is one of my specialty.Thanks for this new idea I'm sure my kids will enjoy eating the cake if it is colorful and attractive. Wow. This surely looks delicious and very colorful too i think kids will love this. Thanks for sharing your ingredients to us. I love chocolates. Eating it can make me feel better and happy. Now I can say that I'm totally hooked up with chocolates.